This Friday, Nov. 10, the Texas A&M College of Architecture will host its annual Outstanding Alumni Awards Banquet, honoring extraordinary former students who, over the years, have laid the foundations on which the college has built a tradition of excellence through academics, research and service. The eight 2006 Outstanding Alumni Award recipients will be feted 6:30 - 10 p.m. at the Miramont Country Club in Bryan. 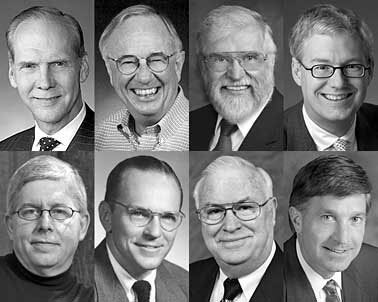 This year’s honorees are: Craig Beale ’71, executive vice president of HKS, Inc.; Velpeau E. Hawes, Jr. ’58, retired architect; Jesús (Chuy) H. Hinojosa ’58, Texas A&M professor emeritus; Richard Riveire ’83, principal with DMJMRottet; Scott Slaney ’76, principal with SWA Group; Arch Swank ’36, posthumous award; Eldon G. Tipping ’68, president of Structural Services, Inc.; and Will Wynn ’84, mayor of Austin, Texas. Wilfred A. Fischer, who at 101 was the oldest living alumni of the Texas A&M architecture program, passed away Tuesday, Nov. 7 in Nashville, Tennessee. A video featuring Fischer, then 100 years old, recalling his experiences at Texas A&M, was among of the crowd-pleasing highlights at the College of Architecture’s April 1, 2005 Centennial Gala celebration. Texas A&M University architecture students are hard at work designing the home of the future -- their entry in the next Solar Decathlon, an elite competition for which 20 universities build a model-home village on the Mall in Washington, D.C.
Held every two years, the upcoming Solar Decathlon is set for September 2007. Texas A&M was selected as one of the 20 competitors out of an international field based on a written proposal, notes Mark Clayton, architecture professor and department head. Sponsored by the U.S. Department of Energy, the Solar Decathlon features teams of college students competing to design, build and operate the most attractive and energy-efficient solar-powered house, explains faculty adviser and architecture professor Pliny Fisk. The purpose of the decathlon is to educate students, faculty and the public on the benefits of incorporating photovoltaic technology into homes. Meghan Wieters, a doctoral student in Urban and Regional Sciences, recently received a $25,000 dissertation grant from the Robert Wood Johnson Foundation for Active Living, making her the third Urban and Regional Sciences Ph.D. student to receive this prestigious grant in the last two years. Previous recipients were Xuemei Zhu and Praveen Maghelal. The grant will help fund Wieter’s research into integrating walking as a means of transportation for office workers. She is currently studying patterns of physical activity by office workers, applying an intervention aimed at increasing their number of walking trips per week. Faye Hays, a senior environmental design major at Texas A&M University, has been selected as a Marshall Scholar. Comparable to the Rhodes Scholarship, the Marshall Scholarship is highly competitive: of the 900 – 1000 applicants who are nominated for application by their respective universities each year, only 40 are selected. The scholarships are tenable for two to three years of post-baccalaureate study at any university in the United Kingdom. Ms. Hays plans to study architectural and urban design at University College London’s Bartlett School of Architecture. Yilmaz Karasulu. assistant professor in the Department of Construction Science at Texas A&M University, contributed to a panel discussion examining “The World of Ethics and On-Line Reverse Auction Bidding” at the Oct. 30-31 International Construction Innovations Conference in Peoria, Ill.
Yilmas, a member of the board of directors of the Foundation of the American Subcontractors Association, Inc., said he is strongly opposed to what he characterized as “eBay bidding on construction projects” and sees the practice as a treat to the industry. Karasulu, who joined the Department of Construction Science at Texas A&M in 2005, is interested in construction materials and methods, construction safety, decision making and applied ethics, project controls and computer and artificial intelligence applications in construction management. He hold a Ph.D. and M.S. in Civil Engineering from Louisiana State University, and a B.S. in Civil Engineering from Turkey. Joining Karasulu on the panel were, Mumtaz Usmen, professor and chair at Wayne State University; Richard Gill, chairman of The Shaw Group, Inc.; Petter Berntzen, senior vice president of Duke Construction; and James Gill, Jr., panel moderator, president and CEO of Iron Mount Corporation. Anat Geva, associate professor in the Department of Architecture, was recently re-elected to serve a second term as the secretary of the National Council for Preservation Education (NCPE). NCPE has over 50 member institutions across the United States. The organization is committed to encourage and assist in the development and improvement of historic preservation education programs and endeavors in the United States and elsewhere; to coordinate efforts related to preservation education with public and private organizations and interested individuals; to facilitate the collection, exchange and dissemination of information and ideas concerning preservation education; and to create public awareness of endeavors in preservation education. The Association for India's Development, Texas A&M Chapter (AID-TAMU), presents "Swaad - A Taste of India," an Indian food festival to introduce the community to the culinary heritage of India, 6-10 p.m. on Thursday (Nov. 9) in the Memorial Student Center Rooms 224-226. 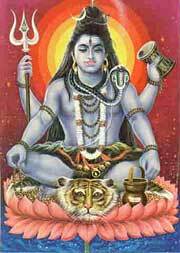 The rich diversity of tastes from the Indian subcontinent have long delighted the world. When Swaad was conceived and held for the first time in 2002, it attracted about 500 visitors and ticket sales alone raised $2000 for projects funded by AID. This year, Swaad aims to repeat its success by bringing a cross-section of recipes from across India, including kebabs, curries and sweets. Tickets are priced at $8 and are available at the MSC Box Office. The Association for India's Development is a non-profit organization with approximately 40 chapters over the world, whose aim is the development of rural and backward areas of India, by funding projects such as education, healthcare, and alternative energy, among others. The TAMU chapter, AID-TAMU, has successfully been able to fund a micro-hydroelectricity project in Western India and recently approved funding for health education in Eastern India. For further information on AID and Swaad, visit http://www.aidindia.org/tamu or email tamu@aidindia.org. The Bryan-College Station Chapter of the International Association of Administrative Professionals (IAAP) is hosting “Are You Caught in the Net,” a presentation by Anne McHenry, president IAAP's Texas-Louisiana Division, 5:30 p.m. Tuesday, Nov. 14, 2006 at the College Station Conference Center. The presentation, which includes food and door prizes, costs $10, payable at the door. Participants are asked to RSVP by Friday, Nov. 10 to Valerie Sorenson at sorenson@cs.tamu.edu. The dean of faculties at Texas A&M University is sponsoring a workshop on developing and assessing learning outcome goals, 11:30 a.m. - 1:30 p.m. Nov. 16 in 701 Rudder. Virginia Lee, a higher education consultant fro Durham, North Carolina, will examine designing courses that insure the greatest amount of learning for the greatest number of students. Participants will learn how to develop outcomes expressing learning most valued for students and how to use such outcomes as a guide for further course planning. The workshop will focus on designing tests, papers and projects that fairly assess learning. To register, call the Office of the Dean of Faculties and Associate Provost at 8845-44274, or sign-up online at http://odf.tamu.edu. Due to the upcoming Thanksgiving Holidays, time sheets for Nov. 2 –15, 2006 should be signed by the appropriate supervisor and submitted by 5 p.m. Tuesday Nov. 14. 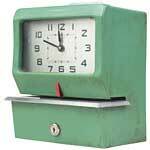 Employees will still enter their time for Nov. 15, 2006, but all time sheets must be submitted and approved by Nov. 14. Questions should be directed to Chris Novosad (845-0552 or CIN@tamu.edu) or Theresa Bramson (862-3025 or tbramson@archmail.tamu.edu) in the business office. Facility Management Industry Advisory Council Fall Meeting 12 p.m. –4 p.m. Annual fall meeting of the FMIAC. Progress during the past year will be reviewed and plans for the upcoming year developed. Faculty, students and industry representatives are invited to this meeting. Will be held in MSC, Room 292. For more information, please contact Susie Billings, 847-9357 or e-mail sbillings@archone.tamu.edu. LAUP Movie Night: “Lumumba,” the true story of the rise to power and brutal assassination of the formerly vilified and later redeemed leader of the independent Congo, Patrice Lumumba. Showtime is 5:30 p.m. in the Preston Geren Auditorium. SWAMP meets: The Screenwriting, Acting, and Movie Production (SWAMP) student group meets 7 – 9 p.m. Thursdays in Langford C414. Members discuss upcoming events and SWAMP member projects. For more information, contact Billy Agan at 832-444-8037 or greenbilly784@yahoo.com. Professional Paper Presentation: Timothy R. Vail will present “School Terror Mitigation Through Design and Construction” 8 a.m. - noon. at a location to be announced. For details, contact Vail at 979-422-9221 or vailarmy@msn.com. Society of Women in Construction (SWIC) meets 7 – 8 p.m. in Langford C111. For more information, contact JoEllen Eggert at 832-928-4202 or joelleneggert@tamu.edu. VIZA Visitor Sessions: The Viz Lab hosts informational sessions to all visitors and prospective students at 10 a.m. An appointment is necessary and may be made at the Viz Lab office at 979-845-3465. All meetings are held in Langford C 429. For more information, contact Margaret Lomas at 845-3465 or marge@viz.tamu.edu. Amrit Singh's Defense: Amrit Singh will present "New Town Sustainable MPC: Reduce Cost & Create Value," 1- 2 p.m. in Langford A 302. For more information, contact Thena Morris at 458-4306 or t-morris@tamu.edu. Student art exhibit featuring work completed Arts 305 Painting and VIST 405 Senior Studio will be on display 8 a.m. – 5 p.m in the Langford Gallery. The show features paintings and collages using intense and subdued colors, as well as work done in Photoshop and 2-D and 3-D animations. A reception for the artists is set for 5 – 6 p.m. Wednesday, Nov. 15 in the Langford Gallery. For more information, contact Mary Saslow at 845-7073 or saslow@viz.tamu.edu. Architect Antón García-Abril lectures 6 – 8 p.m. in the Preston Geren Auditorium. For more information, contact Taeg Nishimoto at 845-8283 or tnishimoto@archmail.tamu.edu. Germany spring group meets: 6 - 8 p.m. in Langford C 305. For more information, contact Dolores Gonzales at 845-1222 or dgonzales@archone.tamu.edu. Healthcare Architecture lecture: Terri Oelrich, RN, with NBBJ presents “Master Planning of Large Hospital Campuses,” in the 4th Floor Central Studio in the Langford Architecture Center Building A.
American Institute of Architecture Students meets 7 - 9 p.m. in Langford B 102, Preston Geren Auditorium. For more information, contact Alexis Mixon at 817-229-5191 or amixon@tamu.edu. American Society of Landscape Architects Student Chapter meets 7 – 9 p.m. in the Langford Gallery. The meetings include featured speakers and faculty. For more information, contact Russell Thomman at 806-239-7656 or ruthomman@aol.com. 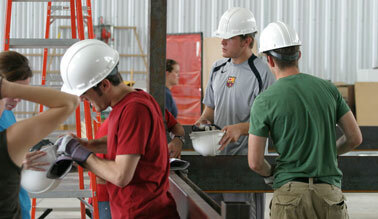 Construction Management Association Student Chapter meets 6:30 - 9 p.m. in Langford C 111. For more information, contact Ann Eastwood at 845-0289 or aeastwood@archone.tamu.edu. 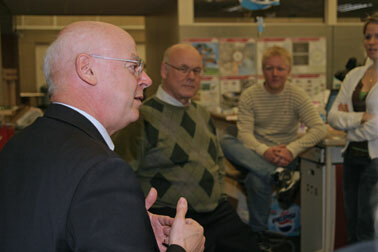 Landscape Architecture & Urban Planning monthly faculty meeting: from 11:15 a.m. to 12:45 p.m. in Langford C207. For more information, please contact June Withers, 845-1019 or e-mail jwithers@archone.tamu.edu. Dept. of Architecture faculty meeting: 11 a.m. - noon in the Langford Gallery. Landscape Architecture & Urban Planning Student Advisory Council meeting & lunch: with department head at noon in Langford A321. For more information, contact June Withers, 845-1019 or e-mail jwithers@archone.tamu.edu. LAUP Movie Night: “The Truman Show.” Truman Burbank lives a happy life. However, what he doesn't know is that his life is actually the focus of a reality TV show aired since his birth, that he's the star, his hometown is a giant set piece, and everyone around him is an actor going by a script. Show time is 5:30 p.m. in the Preston Geren Auditorium. Landscape Architecture & Urban Planning monthly faculty meeting: from 11 a.m. to 12:30 p.m. in Langford C207. For more information, please contact June Withers, 845-1019 or e-mail jwithers@archone.tamu.edu. Rowlett Lecture 2007 12 p.m. - 5:30 p.m. Annual lecture to be held in the Annenberg Presidential Conference Center For more information, please contact Susie Billings, 847-9357 or e-mail sbillings@archone.tamu.edu. AIAS Career Fair: Architecture firms meet and interview students 8 a.m. – 5 p.m. in the Langford A Atrium. Students can use this opportunity to develop job contacts and/or learn about internship opportunities. For more information, contact Amy Kircher at 361-537-5572 or amy_k@neo.tamu.edu. 8th Historic Preservation Symposium: The Center for Heritage Conservation's 8th annual Historic Preservaton Symposium will focus on “Conserving Texas’ WWII Heritage.” The Friday sessions will be at the College of Architecture's Built Environment Teaching and Research Facility, or "Architecture Ranch," at Texas A&M's Riverside Campus. The Friday sessions include tours and reports of WWII and other military buildings, with presentations on the assessment of historic buildings and specific presentations on wood structures. Saturday's session will be held at the Preston Geren Auditorium in the Langford Architecture Center on Texas A&M's main College Station Campus. The day's events include presentations on the Pointe du Hoc D-Day landing site, the rehabilitation plan for the Battleship Texas, and other WWII topics. Continuing Education Units will be avalable. For more information, contact Trisha Gottschalk, 845-0384, or e-mail trishag@tamu.edu or Richard Burt, e-mail rburt@archmail.tamu.edu. 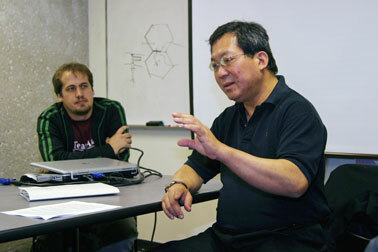 Paul Hyett (above) former head of the Royal Institute of British Architects and chairman of RyderHKS architects, and Ken Yeang (below), an architect renowned worldwide for his environmentally friendly design strategies for high quality ecologically sustainable high-rise buildings, visited the Texas A&M College of Architecture last Monday and Tuesday. In addition to lecturing in the Geren auditorium, both architects met with students and faculty to discuss their work, research opportunities and the possibility of creating a Center for EcoDesign at Texas A&M.